Small Digital Hygrometer Panel. 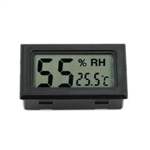 Displays humidity level with 0.1 accuracy in humidity from 20-95%. Also displasys temperatue (Celsius Only from 20C-50C ). Measures 4.5cm x 2.6cm Tall x 1.3cm Deep. Requires 2 LR44 button cell batteries (included). NOTE: Display may vary slightly from product image. Huge sized break-your-own geodes! Wrap these up in fabric and hit them with a hammer and enjoy the crystals inside. Or cut them with a lapidiary saw to make your own geode ends! Gorgeous results. This kit supplies students with the tools necessary for rock, mineral, and fossil identification. The Test Kit includes streak plate, glass plate, hand lens, dropper bottle, magnet, nail, penny, and hardness scale. to 50ºC and 0ºF to 120ºF. White polystyrene backing. One of three meteorite exploration sets. 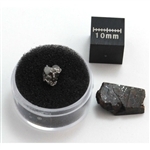 Included in this kit is an iron meteorite (Campo Del Cielo from Argentina), a polished piece chondrite (from Northwest Africa), an educational sheet about meteorites, a magnifying glass, and a neodymium magnet. One of three meteorite exploration sets. 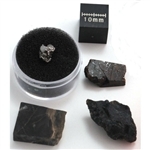 Included in this kit is an iron meteorite (Campo Del Cielo from Argentina), a polished piece chondrite (from Northwest Africa), a tektite (Meteorite glass), Polished piece of Breccia (Earth rock changed from a meteor impact, Alamo bolide impact), an educational sheet about meteorites, a magnifying glass, and a neodymium magnet. Students identify minerals from among dozens of small samples. Streak plates, pipettes, CD-ROM and samples are included in this kit. Students learn to identify 12 common minerals by observing and testing physical properties. Kit contains 1 lb. The biggest variety of the 3 meteorite kits. 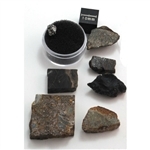 Included in this kit is an iron meteorite (Campo Del Cielo from Argentina), 2 polished pieces chondrites (from Northwest Africa), a tektite (Meteorite glass), Polished piece of Breccia (Earth rock changed from a meteor impact, Alamo bolide impact), A polished piece of NWA 869 (some meteorites are formally analyzed by science institutions and given formal names, this is from that fall in Northwest Africa), a Meteor wrong (many people think they find a meteorite only to find out it is not, this sample is magnetic and has a few other features common to meteorites but it is not a meteorite), an educational sheet about meteorites, a magnifying glass, 10X metal Eye Loupe and a neodymium magnet. USA Raised 3D Map 9" x 12"
There are maps, and there are raised relief maps. Now avaialble are these High raised relief maps that give you a true sense of a locations height! Now you can see how the Rockies compare to the Appalachain mountains. High-raised relief panoramas are a class of relief maps with increased landscape volume. Relief height from 1" to 3” above the surface. Maps measure 9" x 12" and have exagerrated relief on mountainous surfaces. This item has a flat rate of $8 for shipping. Please contact us for quantity shipping.